NETWORK UPDATE: The NBA FINALS adjusted all the way to 6.9, up 0.9 from last year’s Game 1 final rating. As expected, the primetime pre-game JIMMY KIMMEL LIVE suffered from the time zone adjustments, down to 1.1. There were no changes for any of the original series on NBC or FOX. On the rerun front, there were 0.1 increases for THE BIG BANG THEORY, THE ODD COUPLE and MIKE & MOLLY, and a 0.1 drop for IZOMBIE. CABLE HIGHLIGHTS: There was no LIP SYNC BATTLE airing last night, leaving the night open for Syfy’s WWE to take the cable crown at 0.59, even though that was down a tenth from last week. We’s BRAXTON FAMILY VALUES fell 0.07 to 0.51, and lead-out CUTTING IT IN THE ATL lost 0.08 to 0.24. On History, PAWN STARS dropped 0.06 to 0.47, and its clip show lead-in lost 0.13 to 0.36, with LOST IN TRANSMISSION down 0.05 to 0.35. HOUSE HUNTERS (HGTV) slipped a tick to 0.44, but HOUSE HUNTERS INTERNATIONAL fell 0.11 to 0.34. 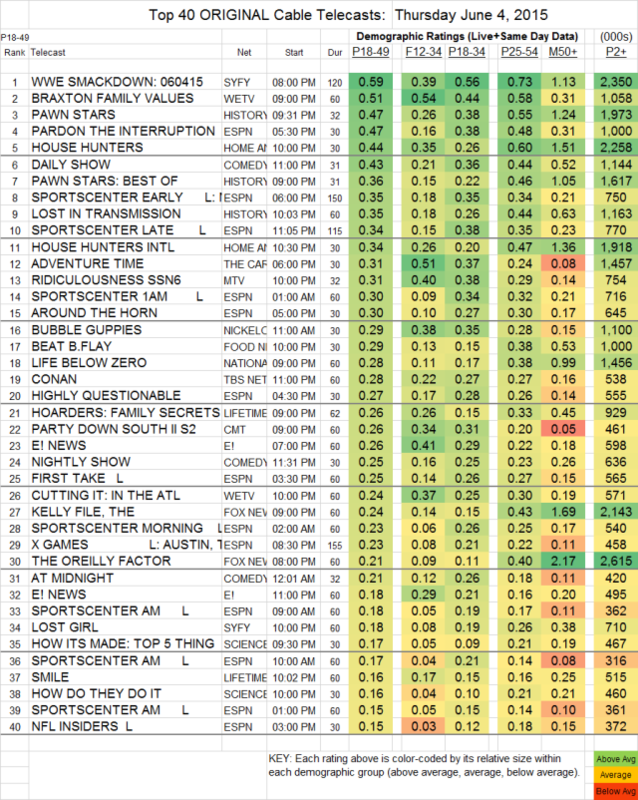 MTV’s RIDICULOUSNESS took a two-tenths hit to 0.31. On Syfy, LOST GIRL gained a tick to 0.18, and OLYMPUS rose 0.02 to 0.11. Without LOUIE as its partner, THE COMEDIANS dived an ugly 0.11 to 0.13. MARON (IFC) was even uglier, down by two-thirds to 0.02, with 76K total viewers.